This beautiful suite is fully upholstered in full soft thick craftsman coffee genuine leather giving an opulent feel to your home living space. Both 3 recliners have whisper quite motors so 4 power recliners in total. Featuring two whisper quiet recliner mechanisms, you can guarantee the ultimate in rest and relaxtion. This magnificent luxury comfortable suite is in stock and ready for delivery so don't miss out on this fantastic suite. 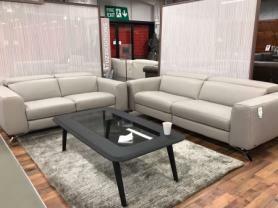 Come down to Furnimax today and experience this wonderful sofa for yourself. Approximate Measurements: 3 Seater: 214 cm. 2 seater 158 cm. Depth 93 cm.